While the Northeast part of the US digs its way out of a horrible snowstorm, the West coast in bathed in sunlight. How lucky PowerHikers are to enjoy the wonderful weather. On Southern California beaches everyone enjoys the sun and in the Bay Area the Golden Gate Bridge sparkles in the sunshine. How lucky to be out and enjoying such spectacular winter weather. 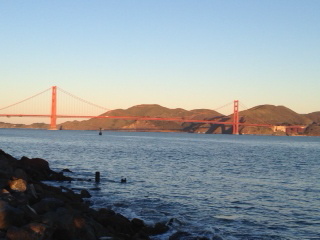 What a gem of history and scenery the Presidio of San Francisco is! With trails throughout, fabulous views, good restaurants, the Disney Museum, a golf course, Lucas Studios, birds, wildlife, a new boutique hotel and military history, the Presidio of San Francisco is not to be missed! 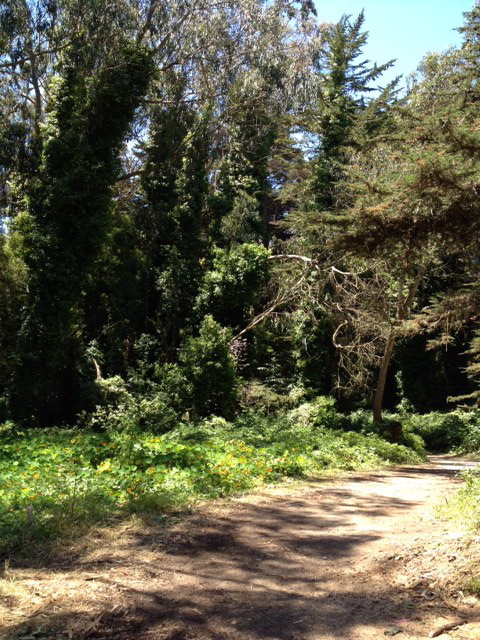 PowerHiking San Francisco 3rd Edition takes you there. This photo is on the Ecology Trail, one walked in the book. Come see other photos and hear about the Presidio and fabulous Lands End at our book signing and presentation tomorrow night, Thursday, February 7th at 7 pm at Books Inc Opera Plaza at 601 Van Ness in San Francisco. We are looking forward to seeing you! 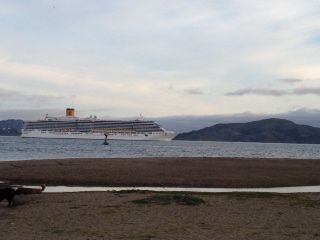 What a sight to see this beautiful cruise ship sail under the Golden Gate! Outlined against the Marin Headlands and Angel Island, it appears enormous. Yesterday the Golden Gate was shrouded in fog as several huge tankers sailed under the famous bridge. You are currently browsing the Powerhiking's Blog blog archives for February, 2013.